The Triton Troupers Circus proves that you’re never too young or too old to enjoy the circus. 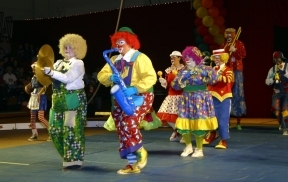 The Triton Troupers Circus returns for its annual show from March 26-28 on Triton College’s main campus in River Grove. Expect an explosive, daring show that will provide fun for the whole family, featuring such circus acts as tightrope walking, trampoline, stunts, cycling, juggling, the gym wheel, trapeze, teeterboard, stilt walking and clowns. The show will take place in the Robert M. Collins Gymnasium, in the R-Building, on Triton’s campus located at 2000 Fifth Ave. in River Grove. Tickets are $6 (no debit or credit cards accepted) and available at the door. For more information about the circus, call (708) 456-0300, Ext. 3383, or visit http://tritontrouperscircus.com.